Up to 2 Small dogs negotiable with additional deposit. Water, garbage, sewer, pool, all included! 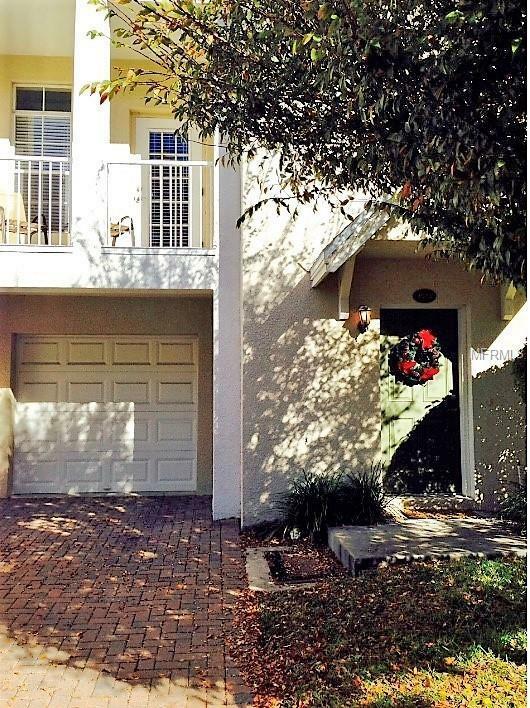 3-story townhome in the Legacy Park gated community. Wood flooring on the 2nd level main living room, tile in the kitchen and baths, and carpet on the stairs and bedrooms. One-car garage attached and another spot in the driveway. Each bedroom has its own private bathroom. One bedroom on the first floor with private bathroom that could be a home office or a private guest room. The second floor features the wide-open living/dining/kitchen area and half bath. Modern upgraded kitchen with an island. 3rd level has a Master bedroom with plush carpet, upgraded bathroom and private balcony as well as the 3rd bedroom and laundry closet. Washer/dryer is not included. This unit is also an end unit. Legacy Park is secured by two gated entrances and offers a clubhouse, large outdoor kitchen with several grills and community pool. $1800 for first 6 months and $1900 for next 6 months for lease starting before Feb 15.Anderson, Madison, Robinson school districts. Very convenient close to MacDill AFB, Gandy Bridge, Crosstown Expressway to downtown Tampa.Each adult occupant will need to sign the lease and undergo individual application checks for background criminal, eviction, credit, landlord and income verification. No Co-signers. Application fee $85 per adult. HOA also requires a separate application and fee of $50 per adult which will be credited back to you when you move in.